The driver says something in Spanish, and points to the right. We look out the window and see two peaks rising above the trees. This must be the two volcanoes that make up Ometepe, we think as we near the San Jorge ferry port. Excitement courses through us. No matter how many volcanoes we’ve seen this past month on our Costa Rica and Nicaragua adventure, it hasn’t gotten old seeing those majestic peaks rise above the clouds. Ometepe is unique. An island formed from two volcanoes within a lake, Ometepe is much more of a tropical rainforest atmosphere than it is ‘island vibes‘. There is no surfing here, as it’s surrounded by a freshwater lake, and most of the activities are focused around Concepción and Maderas, the volcanoes making up the island. We came to Ometepe from San Juan Del Sur, a small beach town in the south. We shared a taxi with some friends we had met in San Juan, which cost us $10 each ($50 total) and took about 45 minutes to arrive at San Jorge. If coming from San Juan, you can also take a bus to Rivas, and then taxi to the port, but it takes much longer. We recommend just doing what we did and finding people in your hostel heading in the same direction to split a taxi with. In order to get to Ometepe, it is necessary to take the ferry: an hour long, uncomfortable ride across Lake Nicaragua. Be prepared for a crowded ship, no sitting room, and a sweaty journey over the largest lake in Central America. But on the plus side, at least they serve beer! The ferry from San Jorge runs to two ports: Moyogalpa and San José. You’ll want to take the one to Moyogalpa, a 60 minute ride from San Jorge that leaves every hour and costs about $2 each way. Moyogalpa is the largest town in Ometepe, and will be where you rent transportation (scooters, ATV’s, dirt bikes, etc. ), and most likely where you will stay your first night on the island. A colorful port town, you’ll find plenty of bars and restaurants, hostels/hotels, and stray dogs here. Ometepe seems like it’s from a different time, and it’s common to see men on horseback herding cattle through the streets. We rented scooters in San Jorge, from the same man we purchased our tickets from (read below on why we don’t recommend this). He gave us a voucher and said the men who would rent us the scooters would meet us at the port and drive us to the rental shop (a.k.a. their house). Let me give you a piece of advice: RENT DIRT BIKES OR 4-WHEELERS!!!!! If you plan to travel outside of Moyogalpa (and you should), don’t rent scooters!! The roads in Ometepe are extremely underdeveloped! Once you get past Moyogalpa, the bumpy paved roads become hilly dirt/rock roads that are nearly impossible to navigate on a scooter. Although we managed to make it to the San Ramon waterfall via scooter (twice! more on that below), this is not something we would recommend! The men we rented from were impatient in teaching us how to use dirt bikes, so we rented scooters by default (don’t rent a motor bike with little to no experience, as they are dangerous, especially on the unpaved back roads of Ometepe!). Furthermore, as we drove towards our hostel we saw many rental shops charging far less than we had paid to rent our scooters, and it occurred to us that we had been duped by the ticket man into thinking that was our only option. *Note: Wait until reaching the island to rent modes of transportation, and don’t pay more than $35/day for a scooter or motorbike. 4-wheeler’s are much more expensive, and will cost you about $80/day minimum. It’s worth noting that there is a local chicken bus that runs on the paved parts of the island, but we don’t recommend it. Much of the island is unpaved, and therefore needs an alternate mode of transportation to be seen. Only having 2 full days to really explore the island, we chose not to do Ojo de Agua. Being from Florida, these crystal clear cool water springs are found all over the state, and we’ve been to over 30 of them in the past year. If we had more time in Ometepe, we certainly would have gone for a dip in one of Ojo de Agua’s two natural springs, however this just wasn’t a priority for us. Entrance into this tropical sanctuary is 40 Cordoba, or about $2 USD, for the entire day. They serve food and beverages here as well, and we recommend taking a day to relax here and cool off from Nicaragua’s humid heat and enjoy this natural oasis. By far our favorite (and most eventful) adventure we went on in Ometepe was the San Ramon waterfall. About an hour journey from Moyogalpa, we came here as a day trip. The road here is extremely rocky! Although we made it here safely (thank goodness!!) on scooters, this is not something we would recommend!! We were skidding down the rocky hills at each and every turn and it’s a miracle we didn’t crash or get hurt. Go on a bicycle, motorbike, or ATV! Okay, lecture over. It’s important to note the waterfall is a good one-two hour hike uphill, depending on how fast you go (and if you stop to look for howler monkeys at every turn like we did). You must be in good physical condition, and although the first half of the hike is paved, the second half is more rugged. Expect to climb up rocks and through streams for another kilometer or so. Wear good sneakers or hiking boots and bring plenty of water! Once you get to the top you’ll be rewarded with amazing views and a small, natural pool you can go swimming in. Entrance costs $3 USD. Bonus: Look for the dog pictured below at the restaurant near the base of the hike. He will guide you up to the waterfall! Only possible during the wet season (May-October), the Istrian River lies between the two volcanoes. For $25, you can go on a 3-4 hour kayak tour. Expect to see a variety of wildlife, from birds and monkeys, to turtles and even caimans! Pre-Columbian petroglyphs can be found scattered all around Ometepe. We saw some on the Maderas volcano when we went, but you can also view them at Hotel Finca Porvenir and at Finca Magdalena. Either way you will need a guide. We don’t recommend trying to do the hike alone, as hikers have lost their lives doing so. Maderas (the inactive volcano) is a shorter, but still intense hike (6-9 hours round trip). Concepción (the active volcano) is a longer, more intense hike. The hike is extremely strenuous and takes about 8-10 hours round trip. Expect to pay $30-45 each for a guide, depending on group size. Perhaps our favorite meal on the island was at a friend’s hostel in Merida. The hostel owner, an elderly women they called abuela (grandmother), cooked “family meals” every night, in which guests paid $2 for a typical nicaraguan dish. The night we ate there, it was rice, beans, chicken, and fried avocado (yum!!). She was very accommodating, and even cooked Sara a vegetarian meal since she doesn’t eat meat. We highly recommend having a local cook you a typical Nicaraguan dish while staying here to experience local Ometepe cuisine. With such a friendly, accommodating culture it’s easy to find someone willing to cook you a meal if you just ask around. We recommend offering to pay them or to purchase ingredients as a way of saying thank you. Apart from homemade meals cooked by locals, there are plenty of great restaurants throughout the island. Two that stood out to us were The Cornerhouse, in Moyogalpa (pricey, but excellent eggs Benedict and coffee!! ), and Café Campestre (great international dishes) in Balgüe. Although neither of these places strictly serve typical Nicaraguan cuisine, foodies will appreciate the unique culinary creations each has to offer. Depending on how much time you choose to spend here, you may or may not stay outside of Moyogalpa. For the two nights/three days we were on the island, we stayed in Moyogalpa the entire time. If you are spending three or more nights here, we highly recommend staying in a different town. There are various hostel options all over the island, all super cheap (we’re talking under $10/night). There are boutique hostels, B&B’s, home-stays, and organic farming hostels with no wifi that serve three meals a day all fresh from the farm(!). With options for every kind of budget traveller, you’re sure to fall in love with the island no matter what type of accommodation you choose. We recommend spending at least 3-5 days in Ometepe, spending a night (either your first or last night depending on time of arrival/departure) in Moyogalpa, 1-2 nights in the Santa Cruz, Balgüe, Merida area (our favorite by far! Not touristy and perfect for nature exploration on the southern part of the island), and a night in Altagracia (the second largest town in Ometepe, near Concepción). The island may look small on a map, but it’s 19 miles from end to end, with the poor road conditions making transportation throughout much of the island tricky. Expect it to take an hour and a half to get from one end of the island to the other (via scooter, ATV, or motorbike). Take out cash in Moyogalpa, as you may not find ATM’s throughout the smaller towns on the island. Watch out for herds of cattle and horses!! It’s common to see herd’s of cattle heading down the streets of Ometepe. Don’t be afraid, just stop your bike/scooter/4 wheeler and let them pass. They will go around you. Watch out for chickens, pigs, and stray dogs! Another thing that will cross your path on the island is stray dogs, pigs, and chickens. Be aware they roam free on Ometepe and use caution while driving. They can run across the road at any moment so be prepared to brake. Also, be prepared to see many emaciated, sickly dogs roaming the island. This broke our hearts and it was hard not to just claim them as our own and bring them home with us (I mean look at this guy!! ): ). Riding at night: we don’t recommend driving long distances (over 20 minutes) here at night. On our day trip to the San Ramon waterfall, we had to scoot an hour back to Moyogalpa in the dark. We were forced to wear our sunglasses at night due to the vast amount of bugs hitting every part of our body as we rode. This can be hazardous, so we recommend finishing any far away activities and being back on the road before sunset. And that brings me to our final point: BUG SPRAY!!!! 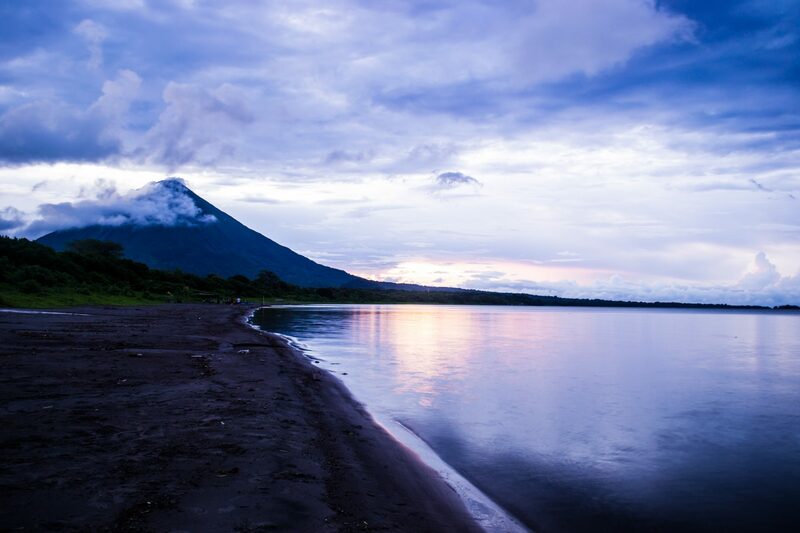 Bring bug spray EVERYWHERE with you on Ometepe. Being an island, it’s much buggier than mainland Nicaragua. Have you guys every been to Nicaragua? Have any recommendations or questions? Comment below!